Guatemala is one of the only 16 countries of the Americas that has successfully implemented the Authorized Economic Operator (AEO), allowing the country to raise its trade competitiveness. With this institution, a person or company enabled as AEO acquires a special status of higher confidence and security at its operations in customs. Complying with delivery times has been a struggle for the logistics chain and it is key to establish long-term, successful international business relations. 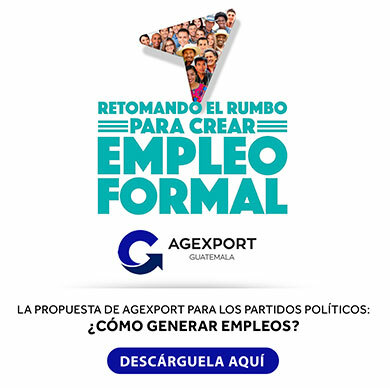 A such, AGEXPORT’s logistics services commission (SIEX) with help from the Chamber of Industry, Chamber of Commerce and the Guatemalan-Spanish Chamber of Commerce, is currently organizing the second edition of the Authorized Economic Operator Summit, to be held on September 05, 2018 at AGEXPORT. With the event, we expect to keep moving forward towards a more agile, secure and transparent trade, said Mrs. Leticia Salazar, president of AGEXPORT’s logistics services commission. The second edition of the AEO Summit plans to receive more than 150 businessmen along with government authorities related with competitiveness and trade, Central American customs authorities, among others. National and international experts will participate on different panels and conferences organized with the objective of explaining the AEO and its implications for importers and exporters. Also, the event will have companies already enabled as Authorized Economic Operators sharing their experiences and the benefits of being catalogued as secure, trustable and financially sound companies by national and international authorities. Since 2010, a total of 23 companies have been enabled as Authorized Economic Operators by the Guatemalan customs authority, becoming strategic allies both for the customs services and for their own trade partners. We expect more companies to enjoy these benefits, which is why we call exporting, importing and industrial firms to attend this Summit and learn first-hand from experts how this global institution works on easing global trade operations, remarked Mrs. Salazar. The Authorized Economic Operator is part of a key alliance between the public and private sectors to join hands and establish a framework that will guarantee the fulfillment of tax and customs regulations. AEOs work nowadays as a global institution successfully used by countries like the United States and Japan, which are key trade partners for Guatemala. Among the requirements that companies must comply with to become an AEO, they need to have at least three years of foreign trade activities, comply with all customs and tax regulations; as well as implement comprehensive security measures. On 2017 alone, the Tax Administration Superintendence enabled a total of eight logistics companies, increasing by 160% de number of AEOs enabled during the last six years (five companies during the 2010-2016 period). As of May 2018, 10 more companies have been certified, increasing the total number by an additional 125%. By the end of the year, the number could be as much as 200% more with the six files pending approval. Individuals and companies interested in participating on the 2nd edition of the Authorized Economic Operator Summit please contact siex@agexport.org.gt or call (502) 2422-3635.